In an effort to protect their village from the rise in sea levels and protect areas of human habitation, villagers of Nakarabo in Cakaudrove united to construct their village seawall. 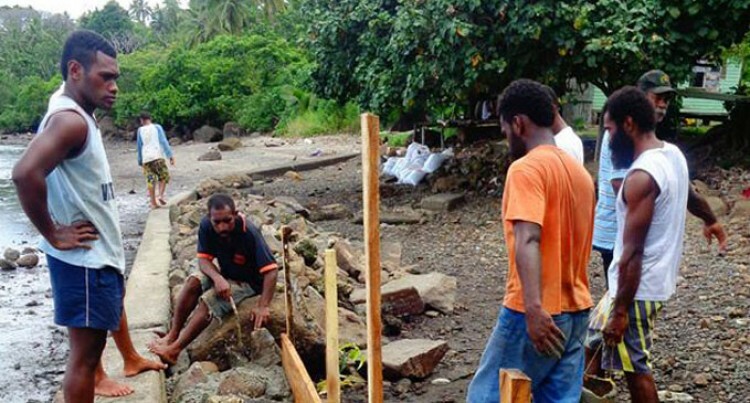 Village headman (turaga-ni-koro) Sikeli Vasulevu said the villagers had all contributed to the construction of their seawall. “During the holidays last year we had a little fundraising drive in the village where village members from Viti Levu also sent in their contributions,” Mr Vasulevu said. He said with the fundraising drive they managed to raise more than $1000 which was used to purchase cement for the construction of the seawall. Mr Vasulevu said the seawall ould prevent coastal erosion and protect the living environment of the villagers. He said with the construction of the seawall it would also help the future generations of the village. Meanwhile, Mr Vasulevu said at the moment, work had stopped as more cement had to be bought from Savusavu Town.